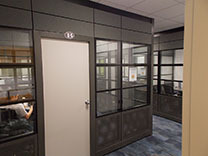 The school wanted to replace individual study carrels with collaborative meeting rooms. We specified Genesis perforated tiles on the bottom and glass tiles above to provide a contemporary look. Conference tables and presentation boards are Mayline Aberdeen, seating is Nightingale, and there is an ECA Isle in each room. The project really came out well and the Dean of the College is thrilled. Compatico worked closely with the local dealer and manufacturer’s representative to assist the NYIT College of Osteopathic Medicine to create five independent meeting areas in their library. The college was looking for modern yet functional, collaborative spaces for their students to meet in groups and work together. Compatico’s Genesis was the perfect solution utilizing a mix of perforated, glass and fabric tiles to produce floor-to-ceiling walls. 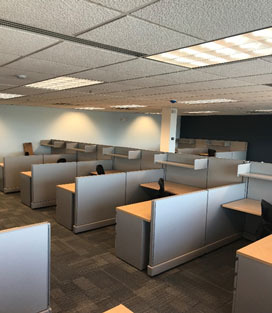 Each collaborative area includes seating, conference tables, white boards, doors, and wire management, all provided by Compatico. Project management support from Compatico was top-notch and offered quick response to a situation regarding mismeasurements. They shipped the additional products needed within five business days, not disrupting the installation schedule. Compatico also created the layout for the client along with providing 2D and 3D images. NYIT was highly satisfied and looks forward to adding more Compatico products to their campus. The stations were easy to install and the client loves the product! My experience with Compatico has been great. Their work ethics are remarkable. They stand by their products. Their agents are personable, responsible and knowledgeable. I look forward to working with Compatico and encourage any one to further their customer networking with them. 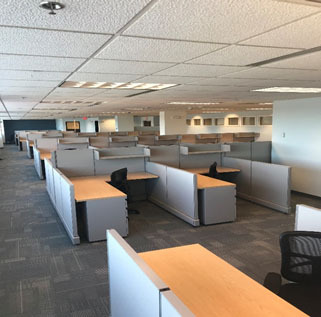 As you know, we furnished our new offices with both AO2 and Compatico F/S. After 'living' with our selection for more than a year now, I wanted to let you know how pleased we are with our selection and the quality of these lines. The Compatico Systems furnishings are a perfect product solution for our office. It looks and performs great, and its versatility allows for future growth. Your experience with each of the departments at Compatico, from sales to customer service and production, were just terrific. Moving can be a stressful experience, and it was a relief to have such attentive service during that time. Looks great, and this is only five minutes from our office, so hopefully more work to come! I stopped by Doylestown Health Physicians this morning and it looks really good. Here are some photos.